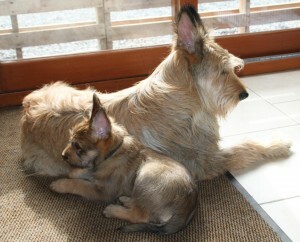 To obtain a good quality puppy, you should go directly to a breeder who is a member of the Berger Picard Club of America. As a rule, the BPCA breeder does not breed merely to sell dogs, but to continue and improve upon a lineage which he/she considers to be the best. Buying from a breeder is not just a business transaction. It is a matching of puppy and buyer and a partnership between breeder and buyer to ensure the puppy gets a good start in his new home. However, in fairness to breeders and buyers alike, the BPCA does not endorse any particular breeder, and cannot be held responsible for any purchase agreement, guarantee, or understanding between breeders and buyers. As with any purchase, you should check references, visit potential breeders, and evaluate options before you buy a puppy. The BPCA Breeders Referral List – The BPCA maintains a breeders referral list of those BPCA breeders who are voting members in good standing and have signed the club’s breeder code of ethics. (See here) The results of their health testing are available on ofa.org and breeders are required to have CHIC numbers on their breeding stock to be listed on this page. Services offered: Puppies available occasionally and stud dog. Services offered: Stud dog service and puppies available occasionally.